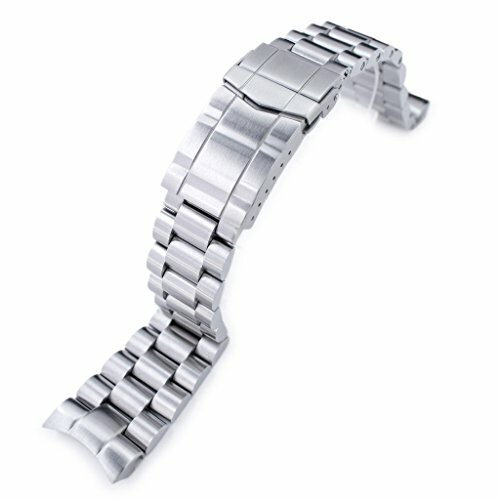 Endmill brushed solid 316L stainless steel watch bracelet is designing for Orient Mako II, Ray II or other watches with same curvature as the above models. Generic 2.0mm diameter Fat stainless steel spring bars are included. All soild links including end links in half-moon shape are structured by screw fix adjustable details instead of common pins. Accompanied with brand new Submariner double locks diver's clasp, made from solid 316L stainless steel with extra 6 micro holes for flexible fine tune length adjustment. Submariner double locks diver's buckle is ideal for watch band with thickness approximate 4.0 - 5.0mm. One of "Must-Have" awesome aftermarket stainless steel watch bracelet for Orient Mako II & Ray II. Today replaces your Orient watch into this unique aftermarket bracelet.